Nabarangpur-Online: Killer potholes claim life of teenage girl in Nabarangpur. Killer potholes claim life of teenage girl in Nabarangpur. In a shocking incident of death due to negligence by National Highway authorities, a 11-year-girl was crushed to death on Tuesday. An angry mob blocked the National Highway No. 26 riddled with potholes and water logging that passes through the town. Following the accident a student of class VI was killed near the Trivani traffic post angry mob pelted stones on police as well as on Truck, police started lathi charge to disperse the mob. Several persons including a Journalist injured in the police excess. police, condemning her death and demanding more safety on the roads for children and people. 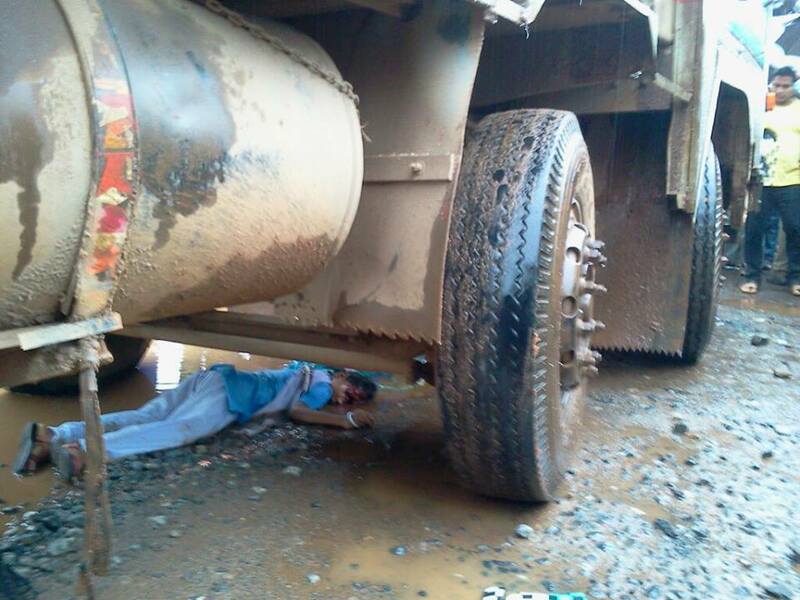 Meanwhile town police registered a case arrested the driver and seized the truck. Two platoons Police were deployed to prevent all incidents said inspector of town police station Ramesh Chandra Bissoyi. The victim was identified as Dipti mayee Behera, a student of class VI of girls high school. She was on her way to school when the truck bearing no CG-04JC 3747 hit bicycle and front tyre ran over her head she died at the spot Mr.Bissoyi said. According to eye witnesses shop keepers she was just crossing the traffic post in which a traffic constable on duty when the truck hit her. “I heard a girl cry out and when I stepped out of my shop, I saw the truck’s front wheel over the head of a child, said. The accident had taken place because of a lack of space by the sides of the traffic post and there were potholes which is dangerous for motorists and cyclists. The entire main road of Nabarangpur town is riddled with potholes and water logging. Why the National Highway authority not taking any step to repair the roads” asks a resident Lakhya Panda. Recently by insisting a case Collector Yamini Sarangi, directed the National Highway authority to fill potholes and repair the main road but in vain.